Bruce has been performing trombone professionally in the San Francisco Bay Area since 1989. 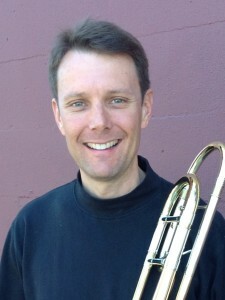 He is principal trombone of the Santa Rosa, Marin, Vallejo, Oakland East Bay, Symphony Napa Valley, Carmel Bach Festival and Fresno Philharmonic orchestras and is a member of the Opera San Jose orchestra. In addition, Bruce has performed with the San Francisco Symphony and the San Francisco Ballet and Opera orchestras. He is in demand as a recording artist and records regularly at Skywalker Ranch in Marin County. In addition to playing modern trombone, Bruce also enjoys performing renaissance and baroque works on a replica of an instrument made in Nuremberg in1595. He is a graduate of the San Francisco Conservatory of Music (MM) and the University of Michigan (BME), Bruce teaches trombone at UC Davis and is a founding member of the San Francisco Brass Company, a Bay Area-based brass quintet.